I remember when this baking sheet of fabulousness came out of the oven a few days ago, I was giddy as I was drizzling the honey over tops. Think sweet and somewhat savory. Don’t be afraid if you’ve never enjoyed butternut squash, it’s got a mild flavor even the kids won’t mind. Especially with the honey factor. Many times you can find butternut squash already cubed and bagged in your produce section of your grocery store. I picked up a nice bag at my Whole Foods and couldn’t wait to develop this simple “candy” tasting vegetable. 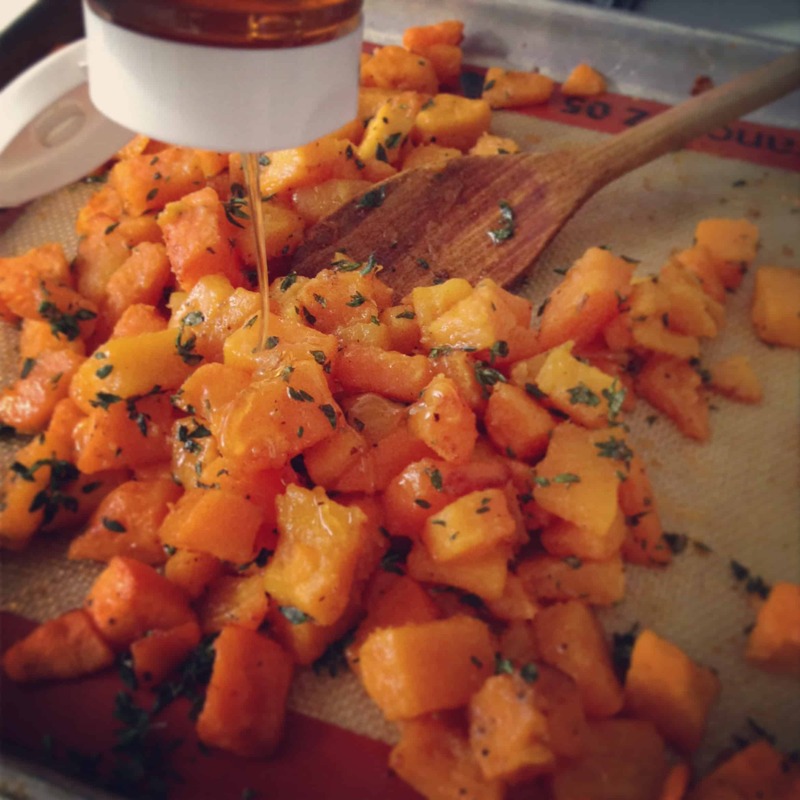 Start by sauteeing your butternut squash in a nice 3-5 quart skillet in some olive oil. Transfer to a baking sheet and roast in the oven for a good 15 minutes, until fork tender. Chop some fresh thyme leaves. 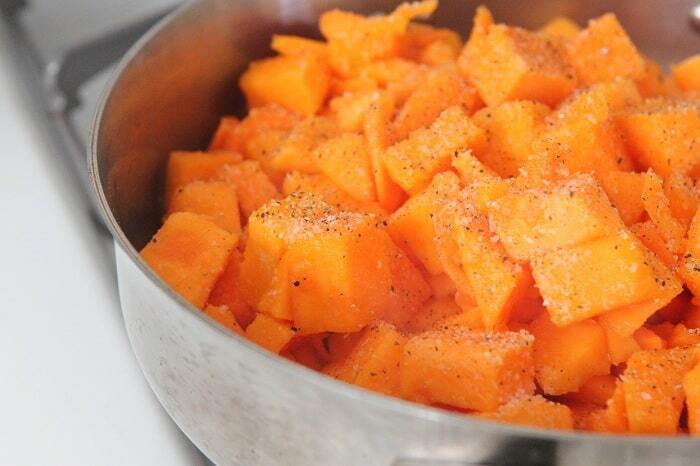 Sprinkle over the top of the roasted squash. Honey time! Sweet, savory and fabulous. Preheat oven to 350 degrees F. and line a large baking sheet with a silpat liner or parchment paper lightly sprayed with cooking spray. Heat oil in a large 3 quart skillet over medium heat. Saute butternut squash, season with salt and pepper and cook for a good 5 minutes, stirring often to get some color on the squash. Tansfer partially cooked butternut squash to prepared baking sheet. Bake for 15 minutes or until fork tender. Remove from oven and add fresh chopped thyme leaves then drizzle with honey. Gently toss to coat evenly and serve warm. Mmmm…this sounds delish! I’ve never cooked butternut squash before. 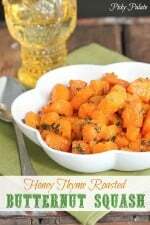 The honey and thyme combo would be really nice with roast butternut squash! I love a warm cozy sweet-and-savory combo like this! 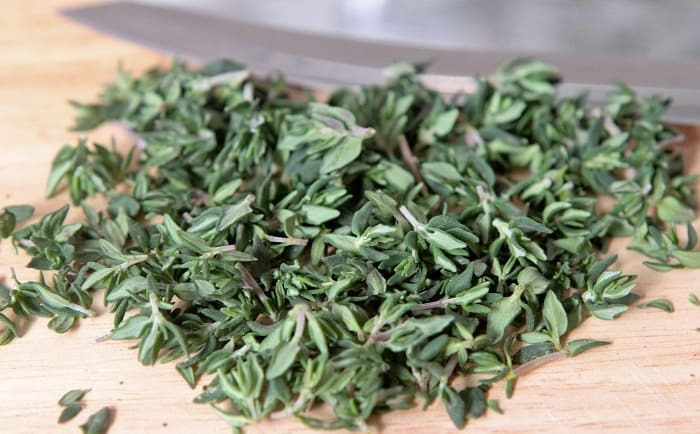 Thyme is such an awesome herb…flavor boom!!! Loving this simple and easy but FLAVORFUL side dish!! 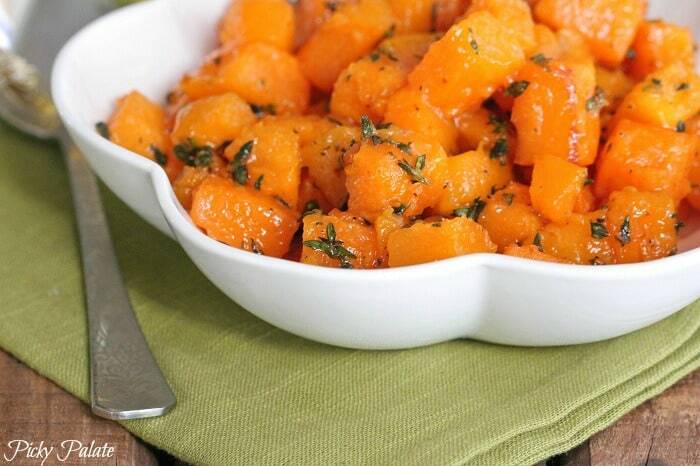 Thyme and Butternut squash are perfect together! Loving the flavor combo of honey and thyme! 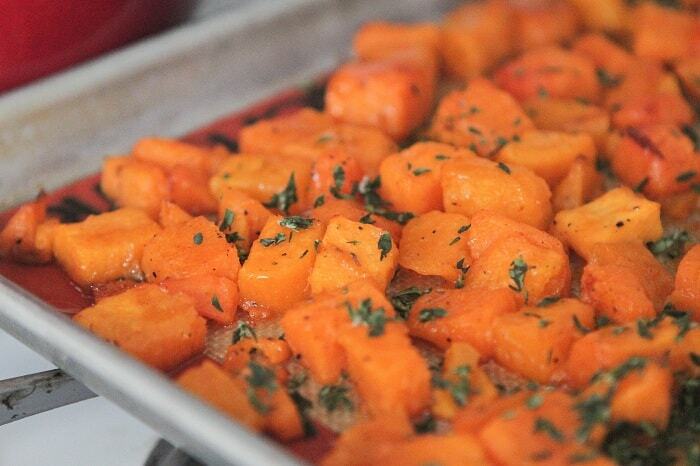 Roasted butternut squash = best thing ever. I could have a big bowl of it for dinner… all to myself! My family- not so much! This looks wonderful! 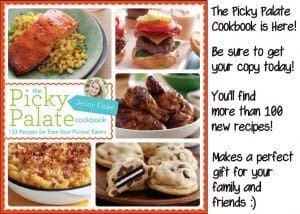 what a wonderful medley of flavors, Jenny!! squash is one of my fav winter veggies! Looks delish. 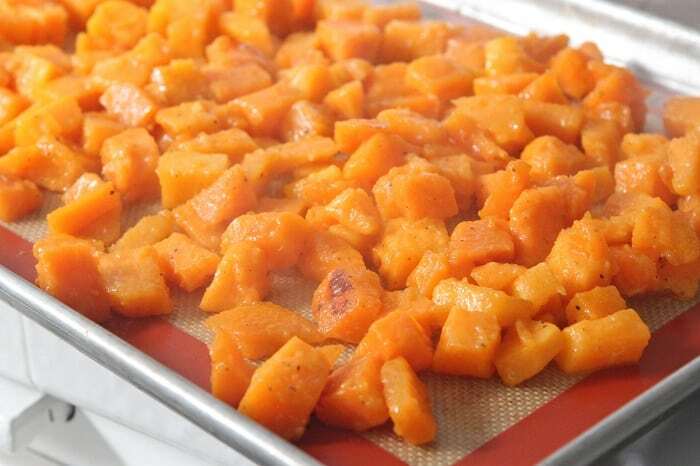 Simply roasting butternut squash is my favorite ways to enjoy this winter veggie! Oh man..I need to make this over the weekend!! Thanks Rosie 🙂 I’m not sure if I’ve ever enjoyed butternut squash so much, lol! Loved the combination. Its so great and sounds so mouthwatering. Oh My God this is happening in my kitchen ASAP. 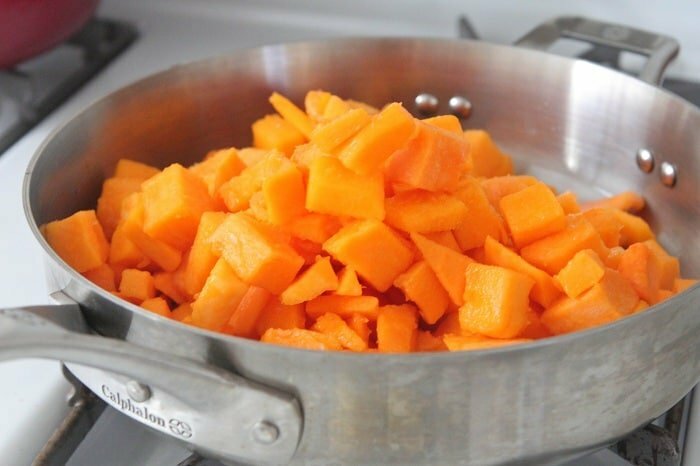 I absolutely love butternut squash and have a bag right now that I’ve been putting off cooking because I wanted to do something different…this is it. Thank you thank you thank you! Hope you loved it Shaina!! As always, this looks simple and fabulous. Thanks for sharing. 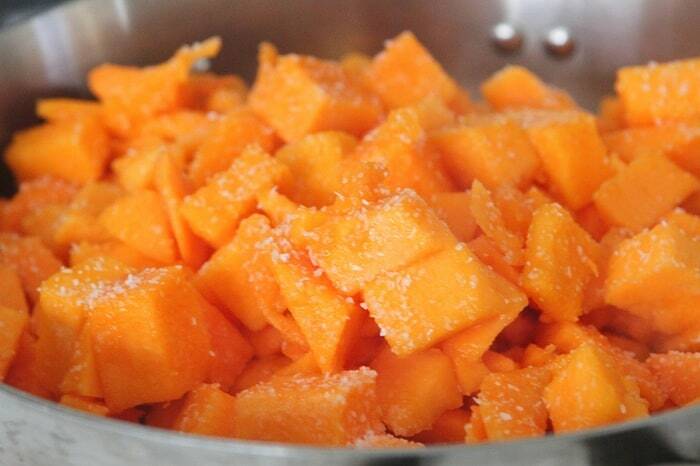 I love butternut! This looks great! I think this maybe be a featured side at our dinner table a few nights a week :). Stunning photos! This was DELICIOUS!!! Loved it and so simple! I make butternut squash so often it’s almost ridiculous. It’s one vegetable that my kids don’t give me grief about! I typically roast it with maple syrup, cinnamon, and sometimes I roast apples with it, and top it with toasted pecans. I’ve never made it with thyme before, however, so I’ll just have to try it. I’ve never got enough recipes for one of my favorite squashes, and this looks great! We love butternut squash but I haven’t done a savory squash dish yet. I usually just roast it. Why did you sautee it before roasting it? Sounds like a lot of extra work to me! 🙂 I am curious, not being a hater. 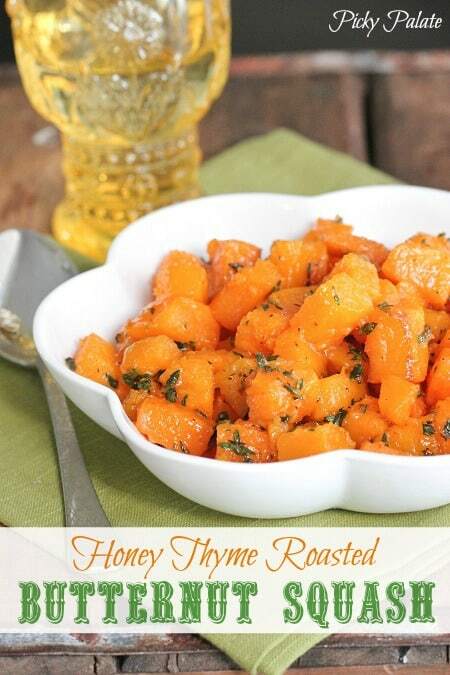 🙂 I am going to try the thyme and honey with some yams tonight since it is what we have. We love yams too and often use yams and butternut squash interchangeably. The Contender: Brings up your lida daidaihua reviews http://gw2goldabc.allmyblog.com/40-switch-matters-as-many-as-help-crack-negative-routines.html entirely being a way to mention their own (possibly larger sized decline).